The Shih-Poo is a cross between a Shih Tzu and a Miniature Poodle. They are a small, long-haired breed. The Shih-Poo has a round face with round eyes and a long nose. They have hanging ears and a triangular muzzle. 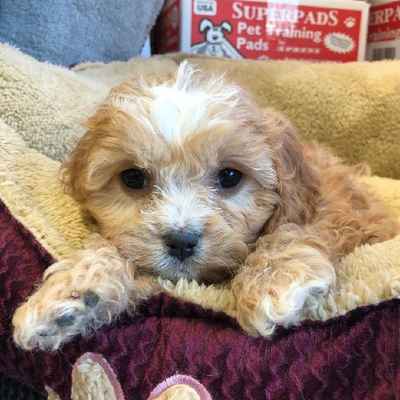 A Shih-Poo’s coat can come in a variety of colors including tan, black, apricot, cream, sable, white, red, and chocolate. Shih-Poos are known to be a quiet and obedient breed. Although its bark can be louder than A Shih Tzu, they are not typically “yappers”. Due to their size, Shih-Poos are typically known to be shy towards strangers. Shih-Poos know how to socialize with children, the elderly, and other pets. They are also fairly easy to train due to their intelligent and alert nature. Shih-Poos are also loyal, loving, and affectionate. Copyright © 2018, The Left Paw & Pinogy Corp.